Hitler Youth, German Hitlerjugend, was an organization set up by Adolf Hitler in 1933 for educating and training male youth in Nazi principles. Under the leadership of Baldur von Schirach, head of all German youth programs, the Hitler Youth included by 1935 almost 60 percent of German boys. On July 1, 1936, it became a state agency that all young “Aryan” Germans were expected to join. Upon reaching his 10th birthday, a German boy was registered and investigated (especially for “racial purity”) and, if qualified, inducted into the Deutsches Jungvolk (“German Young People”). 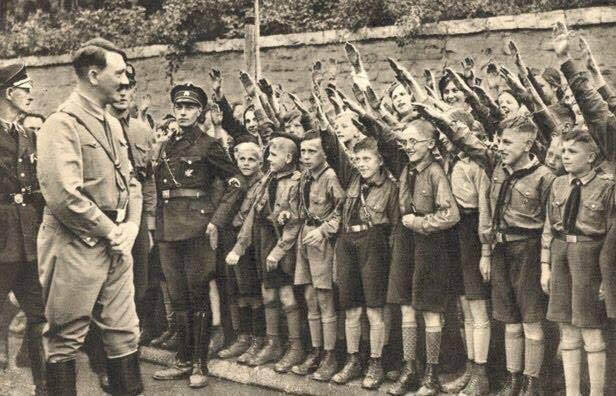 At age 13 the youth became eligible for the Hitler Youth, from which he was graduated at age 18. Throughout these years he lived a spartan life of dedication, fellowship, and Nazi conformity, generally with minimum parental guidance. From age 18 he was a member of the Nazi Party and served in the state labour service and the armed forces until at least the age of 21. Two leagues also existed for girls. The League of German Girls (Bund Deutscher Mädel) trained girls ages 14 to 18 for comradeship, domestic duties, and motherhood. Jungmädel (“Young Girls”) was an organization for girls ages 10 to 14.